Enter the exciting field of medicine with the certified nursing. 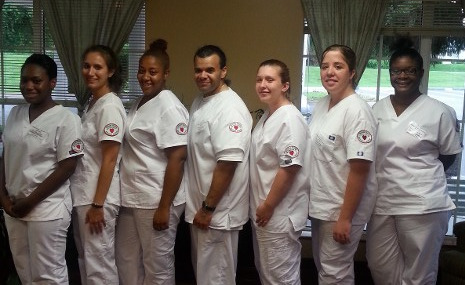 patient care assistant and medication aide classes at Jullian's Health Education Academy in Ruckersville, Virginia. Our state-approved courses are producing qualified professionals to meet a variety of healthcare needs in Virginia. Medication aides can administer medication in assisted living facilities. To become a Medication Aide you must first be a Certified Nursing Assistant (C.N.A. ) or a Patient Care Assistant (PCA) who has taken the 40 hour training course approved by The Virginia Department of Social Services. The 68-hour course is designed to teach the student such things (but not limited to) medical practices such as, infection control, medication administration, side effects and adverse reactions of medications along with a section dedicated to the teaching of diabetes.At the completion of the course, the medication aide graduate can sit for their licensure exam. Medication Aid classes are available during daytime and evening hours. Jullian's sister, Felicia Correa, is a visiting instructor who is diagnosed with Multiple Sclerosis. Besides knowing what it is like being a patient in a hospital, she brings a new flair and different unique teaching style to our student audience, while at the same time serving as an exemplary mentor to both her class and the community. This course is currently being taught by Leslie Boyer, RN and Administrative Officer at Jullian's Health Education Academy, LLC. The Patient Care Attendant is a 40-hour state-approved course in direct care. This course is approved by The Virginia Department of Medical Assistance Services. After completing the course, the student can work in homes approved by the Department of Medical Assistance Services and Virginia and assisted living facilities. The PCA classes are available during days and weekends. These courses are designed to help the nursing graduate learn study techniques and an overall review of what they were taught in nursing school . It’s excellent preparation for the Virginia State licensure exam. Jullian's Health Education Academy offers refresher courses for the student who has never taken the state exam or for the student who may need to retake part of or the entire exam. If you are a C.N.A. and your license has lapsed you may need to retake the written and competency exam. This class would be good for you. Please check first with the Virginia State Board of Nursing. We also cater to those students who have disabilities or different learning needs, but are physically and mentally able to work in the healthcare system. We teach our students to focus on their abilities, not their disabilities, whether it's the patient or themselves. Jullian himself spends alot of time in the patient role in different healthcare settings. Jullian’s mother is legally blind, as well as the owner of the Academy while maintaining the position of the Lead Instructor. Jullian's sister Felicia, a visiting instructor for our Medication Aide program, also suffers from Multiple Scluerosis. So the entire staff at Jullian's Health Education Academy knows what it was like to be on the receiving end of the healthcare system. We know and understand the importance, first hand of the need for well trained individuals entering the healthcare profession. Contact us in Ruckersville, Virginia, to learn more about certified nursing and medication aide classes.